The report card on America's urban schools is in, and Detroit's grades aren't good. That said, the overall increase in Detroit Public Schools students' performance on the 2011 National Assessment of Educational Progress provides hope to Detroit, the worst-performing of the 21 cities surveyed. "DPS shows progress in rigorous NAEP, being only one of six districts nationally to show increases in student test scores, while beating state's gains on math and reading," the district said in a press release. Detroit began administering NAEP in 2009, yielding only two inconclusive data points. Between 2009 and 2011, reading in 4th grade increased by four scaled points. In eighth-grade reading, performance increased by five scaled points. 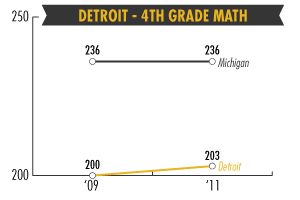 In math, Detroit saw an increase of three points in fourth grade and an increase of eight points in eighth grade. NAEP is scored on a 500 scale. Detroit was also highlighted for its smaller gap between the average scores of high- and low-income students. In the eyes of DPS Emergency Manager Roy Roberts, the gain was "progress, substantive progress, on academics." He tied the scores to the positive news on the district's decreasing deficit. "In the long run, it could be an indicator that you're doing the right thing if your scores increase," said Timothy Shanahan, an education professor at the University of Illinois at Chicago who used to run Chicago Public Schools' assessments. "But you can't look at two consecutive data points and say we're really cooking now." While NAEP scores are widely cited, score changes over time can be a reflection of trends outside the classroom, such as changing demographics, attrition, measurement error and changes in circumstances, including the effects of the recession. It is also important to bear in mind that NAEP does not track individual students. Beyond the big picture, it is likely that the test's performance data will be used to judge officials, especially in Detroit and other cities, such as New York City, Washington, D.C., and Atlanta, that have taken on headline-grabbing reform plans. Like other city leaders, Roberts did not resist the urge to tie Detroit students' modest gains to policy changes. "Of the factors that impact academic success in this district, I am convinced-based on conversations with educators, retired principals, current teachers, administrators and parents-that the single biggest factor impacting DPS is instability," Roberts said. "We've had far too many changes in administration and far too many leadership changes at the school level." But that statement comes as Detroit prepares to move schools into the Educational Achievement System, a new special district for Michigan's worst-performing shcools -- a change that could have dramatic consequences depending on which turnaround plans are used for its schools. And despite Roberts's crowing, Detroit is still performing well below other urban districts. DPS fell slightly behind Fresno, Calif., Cleveland and Milwaukee, Wis., in fourth-grade reading. Some 57 percent of Detroit students were found to be performing "below basic." 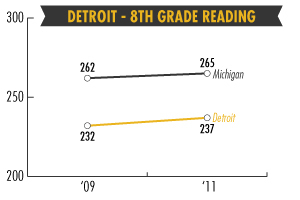 Detroit tied with Washington, D.C., as the lowest scorer in eighth-grade reading. 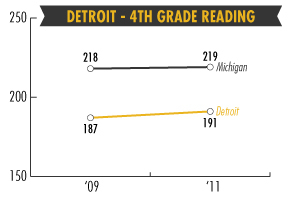 The average Detroit score in fourth-grade math was more than 10 points below Cleveland, the next-highest scoring. On that test, 66 percent of students were found to be performing below basic levels. 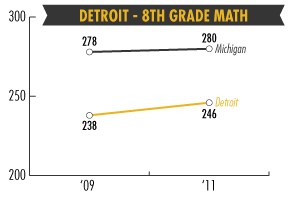 Detroit did similarly poorly in eighth-grade math. Seventy-one percent of students were found to be performing below basic; only 41 percent were able to correctly answer a question on subtraction.